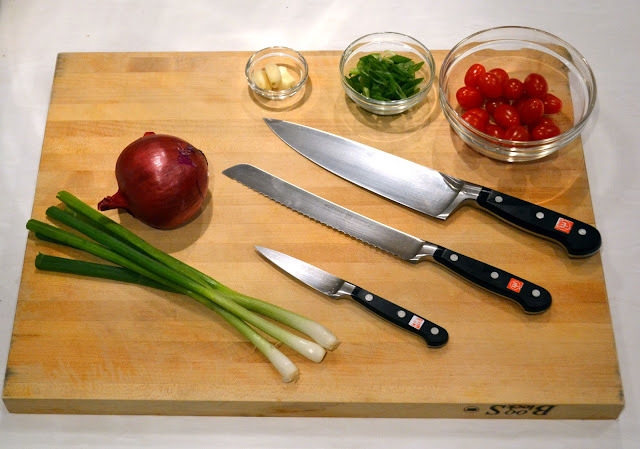 Quality knives, cutting boards and mixing bowls make cooking at home a joy. 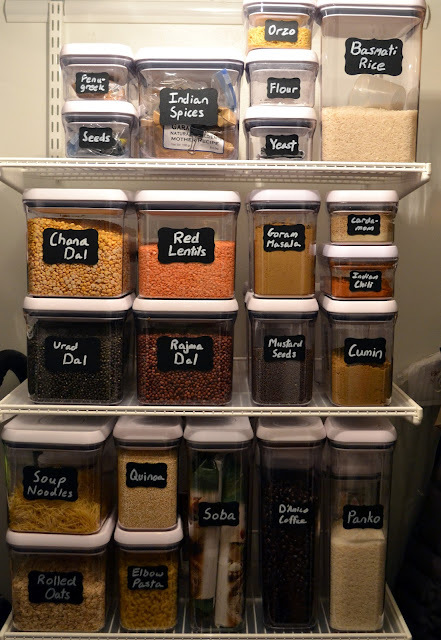 Deciding how best to equip your kitchen can be a daunting task. In this series, we have tried to take the guesswork out of that process by recommending what we think a basic kitchen should have, and what you can do without. We recommend specific products that we think perform well and are worth buying. We have included pictures of those products with prices, which you can click on if you would like to get more information or consider purchasing something. If you have additional questions or want more advice, please also feel free to email us or post a question on our facebook page. We are always happy to talk about cooking. The best way to equip a kitchen on a budget is to shop at a restaurant supply store. New York has many such stores (just visit the Bowery north of Chinatown) and every city should have one. There, you can find everything you need for a basic kitchen in perfectly good quality for much less than at any home goods store. I would forget about cheap product lines from department stores as they tend to be flimsy, do not perform well and need to be replaced frequently. A better plan, I think, is to get your basics at a restaurant supply store and otherwise invest (gradually if that makes you more comfortable) in quality equipment that will last you a long time and won’t often have to be replaced, if ever. My trusted chef’s knife, bread knife, and pairing knife. A basic kitchen should have at least three good, sharp knives: a chef’s knife, a pairing knife, and a bread knife. You can buy them cheaply at a restaurant supply store, or invest in quality knives that will last a lifetime. 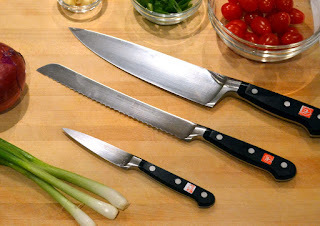 If you want to start by investing in one good knife, make it a chef’s knife, which really is essential to any kitchen. A wooden storage block is a good idea. Take care of your knives. Keep them nice and sharp – in addition to cutting more effectively, a sharp knife is safer because a dull knife can slide off food instead of cutting through. A knife sharpener is not a bad investment. Always cut on a cutting board and wash by hand to avoid dulling the blade. It’s worth it. A chef’s knife is your all-purpose knife for cutting up ingredients. It should be about 8 inches long and heavy, with a nice curved blade. It is curved to allow you to rock the knife back and forth on the cutting board for a more precise cut and an easy mince, saving you valuable time and effort over cutting with a smaller knife. These are some chef’s knifes that I think provide good quality for the price and will last you a long time, if not forever. I use Wusthof Classic. Other reputable brands include Henckels, Shun and Global. Shun knives are a real splurge, but they’re beautiful – a special gift for someone who loves to cook. A bread knife is a long, serrated knife that can cut through breads and bagels easily with a back-and-forth motion without crushing them. It is also great for other jobs, like cutting up a pineapple, that take better to sawing rather than slicing through. If you want to grow your collection, consider buying a prearranged knife set or adding a santoku, a carving knife, or a utility knife. If you are like me and enjoy cooking together with someone else, you might consider two chef’s knives or a chef’s knife and a santoku. I’ve picked out sets that I think make sense as well as some good 3-piece “starter sets” that just include the knives I think are essential. The best cutting board is large, heavy and wood. It should be large enough to give you plenty of space to work and heavy enough that it does not move when you are cutting with a knife. If you use a smaller cutting board, either get one with rubber feet or place a damp paper towel underneath to prevent it from sliding. Cutting on something that moves is scary and bad. I use a Boos wooden cutting board for most of my cooking and a Gripperwood bamboo cutting board with rubber feet for small tasks like preparing breakfast or a snack. I have a separate large plastic cutting board for working with raw meat and poultry. The first three of these cutting boards are ones I use and love. The others also meet my approval. A good set of mixing bowls can make your life in the kitchen much easier. When you need to mix things, beat an egg, or combine ingredients together, it’s better not to use the same bowls for cooking prep that you use for serving and eating; they can get quite scratched up that way. Some kinds of cooking, especially Asian cooking in a wok, require having ingredients pre-prepped and on hand so that when things happen quickly you’ll be ready. A set of small prep bowls will help you breathe easy and thrive with that kind of cooking. 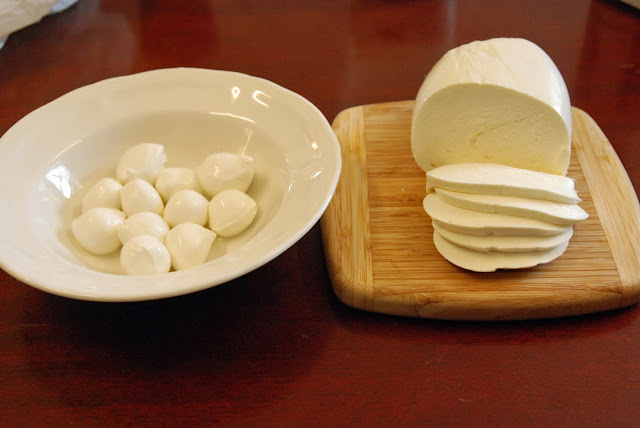 You’ll want a set with multiple sizes made from a material that won’t react with food. Glass and stainless steel are ideal. I use an inexpensive set of ten nesting glass bowls of different sizes and a fancy set of All-Clad stainless steel mixing bowls that I got as a gift. I think the glass bowl set is one of the best kitchen buys there is. When preparing a recipe with lots of prep work, I like to use a big bowl as my “garbage bowl” and sort ingredients into little bowls so that I can keep my cutting board clear. You’ll be surprised how much time you save. Stay tuned for Part II, which will cover cookware and cooking utensils . . .
Great article & I'm very excited for the next part. when shall I get the part 2? Thanks! We are working on Part 2 and will try to get it within the next month. I hope you keep checking back. Hopefully we can help people feel more comfortable cooking and integrating cooking into their busy lives.